It is hard for me to review this book without a bias, because I'm fairly certain that Gretchen Rubin is actually me, living a different life. So much of what she writes about herself hit so close to home over my reading of this book that I'm actually a bit creeped out about it. But let me back up, and begin by putting this book in context: I never read self-help books. I find that, for the most part, they are preachy, repetitive, obvious, and mostly boring. Let me then add that though The Happiness Project would be shelved in the self-help section of many bookstores (if not the biography/memoir category), it is so far from a self-help book that I can't even begin to list the differences. And that's a good thing. Instead of writing a how-to-be-happy book, Rubin has approached the subject of happiness as a memoir. The subtitle gives it all away: "Or, Why I Spent a Year Trying to Sing in the Morning, Clean My Closets, Fight Right, Read Aristotle, and Generally Have More Fun." Long-winded? Maybe. To the point? Absolutely. But by offering us an account of her own attempts at happiness instead of a how-to, Rubin's book avoids the pitfalls of preachy dullness. "My project wasn't like [Thoreau's or Elizabeth Gilbert's]. I was an unadventurous soul, and I didn't want to undertake that kind of extraordinary change... I didn't want to reject m life. I wanted to change my life without changing my life, by finding more happiness in my own kitchen. I knew I wouldn't discover happiness in a faraway place or in unusual circumstances; it was right here, right now." The result is an accessible happiness, the kind that doesn't require major advances from publishers for funding,* abandoning the responsibilities of marriage and family, or any form of drastic, life-altering, stress-inducing change. Not that these excursions and life changes don't have a place, but they don't have a place in Rubin's book. 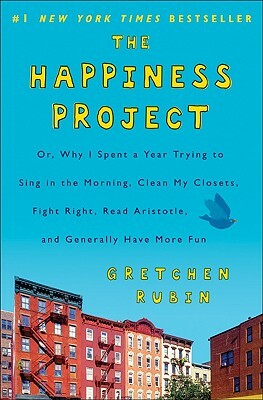 What Rubin's Happiness Project amounts to is a collection of little, manageable changes: go to sleep earlier, make checklists, get something burdensome finished, clean your closets, be nice, smile more, jump up and down. This is not, she argues, the be-all, end-all to happiness, but having energy, organization, and the right attitude are certainly no small part of it. Bottom line: Rubin's inspiration for The Happiness Project hit her on the bus - "The days are long, but the years are short." Anyone who's lived at all knows that a truer statement could not be found - this just about sums up every trite quotation there is on long days, remembering good times, appreciating the now, and so on. In her memoir/self-help-esque/inspirational book, Rubin strikes the perfect balance between memoir and inspiration for those seeking it. She offers an accessible and scalable solution for anyone looking to try their own Happiness Project**, and a fun read littered with quotes, interesting ideas and funny anecdotes for those just seeking a good ol' account of one person's year. *That's Elizabeth Gilbert, for those of you who didn't know that little spoiler about Eat, Pray, Love. ** If you'd like to start your own Happiness Project, Gretchen Rubin offers some suggestions and supplies for getting started over on her blog. You can also join the 2010 Happiness Challenge (although I suppose it's a bit late into 2010 for that?). I'll be making my own project for 2011, following her inspiration. This sounds like a lovely book. And thanks for pointing out Gilbert's little advancement secret. I feel like a lot of her fans aren't aware of that. I have this book but haven't read it yet but it sounds like I could benefit from incorporating some of her tips! Brenna - I was pretty surprised when I found that out (courtesy of Greg's blog, The New Dork Review of Books). Booksnyc - It's excellent! It took me over six weeks to read, because I read in small chunks, but it was definitely worth it!